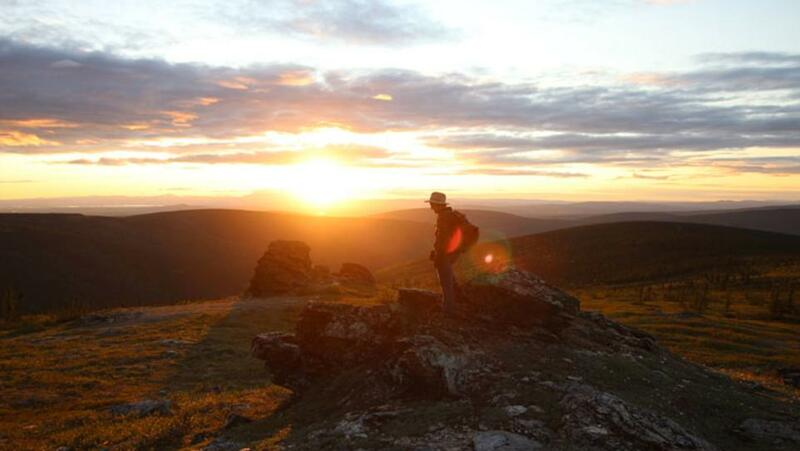 Sunsets and sunrises in Fairbanks, Alaska, perched way up North on the 65th parallel, are in a class all of their own. The onset of the Midnight Sun Season means an extraordinary amount of golden sunlight floods the skies with great enthusiasm. From May 17th until July 27th, seventy-straight days, the sun never dips far enough below the horizon for the sky to ever get dark. Sunsets that happen past midnight seamlessly merge with sunrises, no darkness just light. There are multiple vantage points that afford beautiful views of sunsets and sunrises and Fairbanks Alaska’s everlasting sunshine is sure to warm your heart and nourish your soul. “Partly Cloudy” has turned into my favorite forecast. Nothing against clear blue skies, but the best pictures include some moisture in the air catching some of that low-angled beautiful sunlight. Just like in life- easy relaxing peaceful days are nice, but they can’t all be like that. A truly beautiful life is one with rewarding challenges and mountains to conquer. So when the opportunity comes up to stay up late, get outside and don&apos;t turn chasing sunsets down. My daughter Rio says get up let’s GO! With an excited urgency reserved for youth bursting with life and an unfatigable yearning to see and experience and GO! We are heading to Murphy Dome to chase the sunset to capture it on film to sear it into our memory … we savor the heavenly light, the snow crunching beneath our feet the crisp air reddening our cheeks that makes us feel oh so very ALIVE. Do not allow complacency and coach-potatoed inclinations to steal common yet absolutely extraordinary events from you- Chase the sunset! Seize that moment! Rio and I will reminisce at a later date (a date that allows for contemplation) and realize that nature’s simple yet amazing acts such as sunrises and sunsets (so often taken for granted) can be transformative… get up and GO for such is the stuff that dreams and memories and life itself is made of. We love the Midnight Sun Season so much, that we built the Midnight Sun Tracker tool to share how much daylight we get here in Fairbanks during the year. After-work bike rides to the brewery. Gardening at midnight. Round-the-clock softball tournaments. Hikes that last into the very early hours of the next day. Can you imagine all the wondrous things to do beneath the midnight sun in these northern latitudes during our days of continuous, pure sunlight 24/7? Take a look at our visitors guide and let your imagination wander.